Dates: 05 - 08 April 2017. Spamalot is the Monty Python musical that has been “lovingly ripped off” from the acclaimed 1975 film, Monty Python and the Holy Grail. The original Broadway production of Spamalot won three Tony Awards including the awards for Best Musical and Best Direction of a Musical. Spamalot also won a Grammy Award in 2006 for Best Musical Show Album. Following a successful West End debut in 2006 at the Palace Theatre, MAMA are delighted to bring this fabulous show to Musselburgh. The plot of Spamalot is similar to Monty Python and the Holy Grail; King Arthur along with his squire, Patsy and a selection of knights go on an epic quest to find the Holy Grail. The quest lead the troupe to a French castle, into the dangerous clutches of the Black Knight and a loathsome bunny rabbit, to a rendezvous with the knights that say Ni, and into an intimate liaison with the Lady of the Lake. Unlike the film, Spamalot is jam packed with silly songs to match the action. The opening number “Finland”/ “Fisch Schlapping Dance” was created especially for the show along with other original songs such as “I Am Not Dead Yet,” “The Song that Goes Like This,” and “The Diva’s Lament (Whatever Happened to My Part.” The show also includes the song originally made famous by Monty Python in The Life of Brian, “Always Look in the Bright Side of Life” which is always a crowd pleaser! 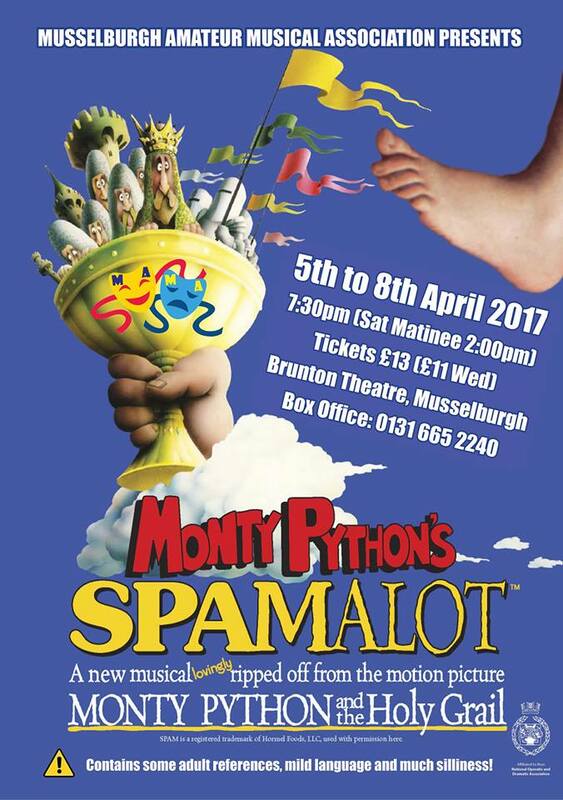 Spamalot is an all singing and dancing production, calling on some of East Lothian's finest talent to create a hilarious show - using traditional musical techniques along with some of Python's greatest comedy! Spamalot has some cheeky, sexual humour and occasional course language therefore may not be appropriate for children under the age of 12.